130 mm/50 B-2LM2 х 2 pcs. 533 mm Triple 1-N2 х 3 pcs. 130 mm/55 B-2-U2 х 2 pcs. Ognevoi — Soviet Tier VIII destroyer. Developed from the Gnevny-class destroyers, the ship (Project 30) featured a larger displacement. In contrast to her predecessors, she boasted improved armor protection for artillery and a more powerful torpedo armament. Ognevoi represents a relatively major shift compared to other Soviet destroyers, which is important for the player to realize as it will surprise them in both fortunate and unfortunate ways. Ognevoi experiences a loss of six knots of speed compared to her predecessor, Minsk, but has a much tighter turning circle. She features four guns in two twin turrets compared to Minsk's five singles, but starts off with 10.0 km ranged torpedoes compared to the 4.0 km options available to previous destroyers. Although her concealment is identical, as a tier VIII destroyer, she gains access to Concealment System Modification 1 ( ), allowing her to achieve superior detection. Ognevoi's turrets can be a mixed blessing. Once upgraded they have more than double the traverse speed of Minsk’s open mounts, which allows the player to handle their ship more aggressively, with less far fear of throwing off their aim. However, with only two turrets, losing a single turret can be severely crippling to Ognevoi, effectively halving the ship's firepower. Thankfully, losing turrets entirely is a rarity once Main Armaments Modification 1 ( ) is installed, and the benefits of their traverse rate and superior ballistics far outweighs this risk. Her 10.0 km torpedo range gives Ognevoi a decent fallback should the worst occur. While their speed and damage is heavily underwhelming, the rapid reloading rate of these torpedoes compared to other torpedoboats at her tier enable her to output far more torpedoes. For example, over the course of five minutes she may (theoretically) output 32.6 torpedoes, whereas her closest competitor in this regard, Z-23, will only drop 26.7 torpedoes. Players should use this to their advantage, as they are less able to rely on the potential for an individual launch to be devastating. Ognevoi is one of the few Soviet Destroyers with decent concealment, giving her an almost 4.0 km stealth-torpedoing window. She's able to get close to most targets and even some other destroyers without being noticed, but players should be aware than not only are Japanese destroyers still stealthier, but also many of the American destroyers, which are very dangerous opponents at close range due to their rate of fire. Having said that, once upgraded Ognevoi mounts the same excellent 130 mm guns that Khabarovsk uses, and they are quite competitive at Tier VIII. Their high rate-of-fire and accuracy make them ideal for harassing distracted targets, and cruisers that wander too close showing their broadsides will find their HP deleted quite rapidly from repeated citadel penetrations. With the faster turret traverse, Ognevoi can better handle itself in close quarters combat, but it will still lose to American destroyers with their faster rate-of-fire. Perhaps the greatest benefit the faster traverse rate will have is the ability to maneuver heavily at medium to long range like other destroyers, previously difficult for Soviet destroyers. Small turning circle compared to the other Russian destroyers. Workable speed. Not the best by any stretch of the imagination, but hey, it's way better than Akizuki's. 10.0 km torpedo range with relatively rapid reload rates allows for launching torpedoes from stealth at mid-ranges. Gains access to the Defensive AA Fire ( ) consumable. Gains access to the Repair Party ( ) consumable. Concealment, although decent, is still inferior to dangerous gunboats such as the destroyers of America and Pan-Asia. Quickly research the upgraded main battery 130 mm/55 B-2-U to benefit from their superior ballistics and more than twice as rapid a traverse rate. Then research the (B) Hull, as the (B) Hull increases the torpedo mounts of Ognevoi from triple-tube launchers to quintuple-tube ones, significantly increases the anti-air power, lowers rudder shift time, and unlocks the option for Defensive AA Fire ( ) consumable in the Engine Boost ( ) consumable slot. Finally, research the upgraded Gun Fire Control System for better main battery range. Captains who wish to forego some stealth in favor of being a harder target to hit should also consider Steering Gears Modification 3 ( ) in Slot 5. Captains who have one of the rare Engine Boost Modification 1 ( ) upgrades and has the Sierra Mike ( ) signal equipped, are encouraged to replace the Propulsion Modification 1 upgrade, as it extends the Engine Boost ( ) consumable duration by 50%, thereby allowing her to maintain a max speed of 42.0 knots for three minutes. It is worthwhile to note that Ognevoi has very similar main armament array to American destroyer Benson and similar concealment. Players used to equipping Benson with Defensive AA Fire ( ) instead of Engine Boost ( ) may find it worthwhile on Ognevoi. However, it should be noted that the anti-air potential of Ognevoi is somewhat weaker than Benson’s. Type 1, 2, or 5 camouflages can be equipped for credits; Type 1 or 5 are recommended at a minimum, as they reduce detectability range. 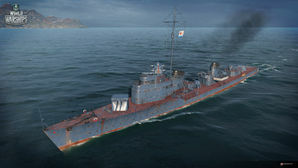 Players who wish to spend doubloons can equip Ognevoi with Type 18 camouflage that lowers her detection radius, reduces the accuracy of incoming shells, reduces her repair costs, and increases the amount of experience she earns. Ognevoi fires torpedoes while engaged in evasive maneuvers. Ognevoi destroys an enemy Atlanta. An enemy Iowa class battleship ignores the puny Russian destroyer. Ognevoi engages an enemy Tirpitz from the safety of smoke. A series of destroyers built for the Soviet Navy during WWII and following the war, the Project 30 and Project 30K Ognevoi-class destroyers were evolutions of the Project 7 destroyers, which although built in large numbers, had proved to have too many flaws, especially in regards to seaworthiness, and thus production was cut short. The Project 30 destroyers sought to correct this, becoming larger with stronger hulls and greater freeboard. They also featured their main battery in enclosed twin turrets, a first for Russian destroyers. Greater engine power and fuel stowage allowed them to maintain the same speed as their predecessors (37 knots) and also increase their operational range. Although many were laid down from 1939 to 1941, only one (Ognevoi itself) was completed during the war due to the German invasion of the Soviet Union. While some were able to be successfully launched and evacuated deeper into Soviet territory, not all could be saved and many hulls were destroyed, some by the Russians to keep them from falling into German hands, and others by the Germans. 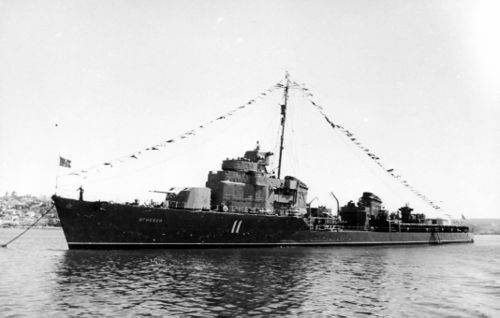 Ultimately only Ognevoi was completed before the end of the war, and after the conflict the design was revisited with the benefit of wartime experience, resulting in the Project 30K (for "Corrected") destroyers, a modified design that ten of the surviving hulls were completed to from from 1947 to 1951. The 30K was slightly longer, and arranged the machinery in echelon. It improved the Anti-Aircraft armament, utilizing 85mm AA guns instead of the 76mm guns of the Project 30. Finally, it added many radar and sonar systems that the Project 30 had lacked, greatly enhancing their detection and combat abilities. Although the ships, even completed to the more modern Project 30K design, still had issues in terms of machinery reliability and lacked a dual-purpose main battery, they proved popular in the VMF, and thus their successors, the Project 30bis Skorry-class, were largely based on them. This class, which incorporated improvements such as a welded hull (where rivets had been used before), improved seaworthiness and endurance, as well as detection systems, proved to be one of the most successful classes in Soviet history, with the largest production run of any Soviet destroyer class - 70 warships. This page was last modified on 10 February 2019, at 18:09. This page has been accessed 39,072 times.